I was first introduced to the Georgetown Women’s Alliance in the spring of my Sophomore year during my time on the Student Advisory Board of the Georgetown Institute of Politics and Public Service. The staff had heard of the Fellowship opportunity and, knowing my passion for women’s issues, encouraged me to apply. From then on there was no looking back, and the GWA has become an incredible staple of my Georgetown experience. My Fellowship falls under the Programming committee. I provide assistance to other GWA members as they plan and execute events, and I have also been given the opportunity to put on a series of events for the GWA. The series is called “How to Hoya” and it brings women connected to Georgetown into conversation with the community, primarily undergraduates, to share their successes and the skills that they feel have best equipped them throughout their careers. This October the first event featured two Hoya alumnae now working as Chiefs of Staff on Capitol Hill. This winter another alumna involved in the STEM field will come to share her skills, and in the spring we are putting together an event on business practices, negotiations, and self advocacy in the workplace. What should the Georgetown community know about the Georgetown Women’s Alliance? The Georgetown Women’s Alliance can truly be a place for anyone. We connect people of all ages and stages, across all Georgetown campuses, for the sake of both community and personal growth. I love that the GWA provides a unique forum to bring together students, faculty, and staff members who all, in one way or another, have a special place for Georgetown in their lives. 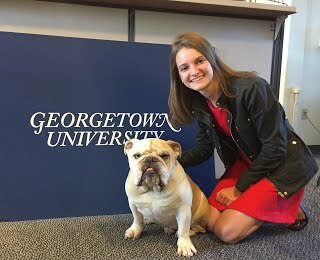 My Fellowship at the Georgetown Women’s Alliance has given me unbelievable opportunities on campus and broadened my horizons for involvement in the community at Georgetown and beyond. Interacting with members of the Georgetown administration has given me insight into how the University works as an institution, and attending GWA meetings has given me the chance to learn and share ideas with some of the most powerful minds at the University. I am beyond grateful to the Georgetown Women’s Alliance for bringing me into their community and allowing me to take part in these discussions.